I have always been pretty comfortable being vocal as a vegan and engaging people about all of the many issues related to consuming and exploiting animals. I am also an unabashed atheist, but I find having serious critical discussions about religion to be an entirely different affair. When dealing with people of faith, my experience is that it is very difficult to question religion (especially in the context of animal exploitation) and keep people from shutting down or knee-jerking; on a larger scale, there is little effort done to shine a light on the inherent difficulties in making a religious argument for other-animal liberation. Equally as frustrating, the majority of those in the atheist, secularist, and humanist movements do not express much interest in, or devote much time to, talking seriously about the ethics of animal exploitation outside of a theological framework without resulting to anthropocentrism and speciesism. That obviously puts atheistic vegans in an odd place: do we focus on critiquing religion as part of a larger conversation against oppression, or do we minimize that concern and instead try to engage people of faith in their own terms? Is secularism a totally separate field than veganism and activism for other animals? Any arguments against oppression and violence offered by religious advocates–whether they be for humans, nonhumans, or even the environment–can be made without mention of divine beings. Any arguments made by slavery abolitionists, suffragists, and civil rights leaders that include appeals to God’s will can be just as powerful and meaningful if the divine is omitted from the rhetoric. Just because positive social change has occurred due to the hearts and minds of religious activists does not mean there is a divine force at play or that the same spirit of progress cannot exist without religious belief. All of these topics are crucial for us to consider if we are to take serious steps away from oppressive systems. As Socha makes abundantly clear, even (indeed especially) religion must receive a critical examination in order to break perhaps the main pillar supporting speciesism. 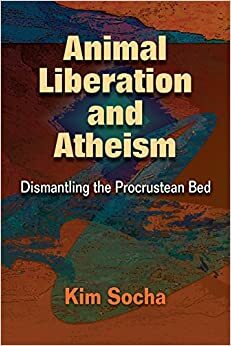 Animal Liberation and Atheism is truly a must read!